"In this proof-of-example, our electronics and antenna were designed so that they can work together to achieve a unique on-antenna outphasing active load modulation capability that significantly enhances the efficiency of the entire transmitter," said Hua Wang, an assistant professor in Georgia Tech's School of Electrical and Computer Engineering. "This system could replace many types of transmitters in wireless mobile devices, base stations and infrastructure links in data centers." "We are combining the output power though a dual-feed loop antenna, and by doing so with our innovation in the antenna and electronics, we can substantially improve the energy efficiency," said Wang, who is the Demetrius T. Paris Professor in the School of Electrical and Computer Engineering. "The innovation in this particular design is to merge the antenna and electronics to achieve the so-called outphasing operation that dynamically modulates and optimizes the output voltages and currents of power transistors, so that the millimeter wave transmitter maintains a high energy efficiency both at the peak and average power." "Within the same channel bandwidth, the proposed transmitter can transmit six to ten times higher data rate," Wang said. "Integrating the antenna gives us more degrees of freedom to explore design innovation, something that could not be done before." "We are merging the technologies of electronics and antennas, bringing these two disciplines together to break through limits," he said. "These improvements could not be achieved by working on them independently. By taking advantage of this new co-design concept, we can further improve the performance of future wireless transmitters." "An antenna structure with multiple feeds allows us to use multiple electronics to drive the antenna concurrently. Different from conventional single-feed antennas, multi-feed antennas can serve not only as radiating elements, but they can also function as signal processing units that interface among multiple electronic circuits," Wang explained. 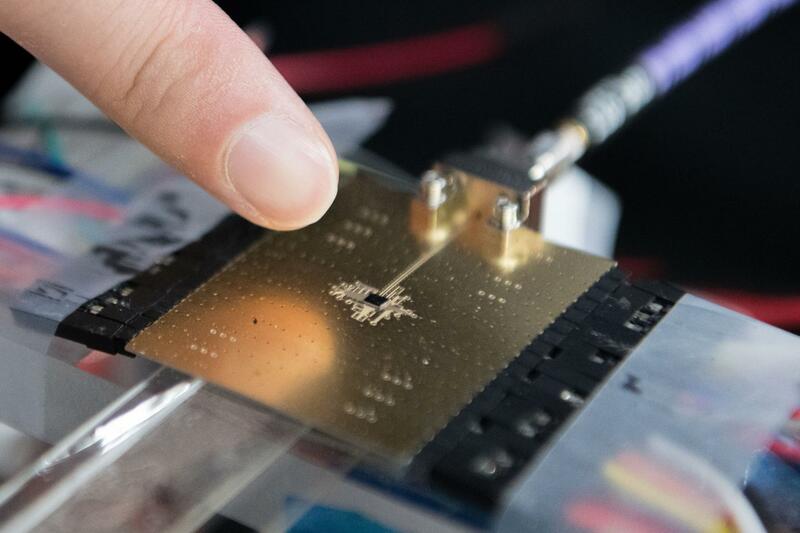 "This opens a completely new design paradigm to have different electronic circuits driving the antenna collectively with different but optimized signal conditions, achieving unprecedented energy efficiency, spectral efficiency and reconfigurability." The cross-disciplinary co-design could also facilitate fabrication and operation of multiple transmitters and receivers on the same chip, allowing hundreds or even thousands of elements to work together as a whole system. "In massive MIMO systems, we need to have a lot of transmitters and receivers, so energy efficiency will become even more important," Wang noted. "Higher energy efficiency also means less energy will be converted to heat that must be removed to satisfy the thermal management," he said. "In large data centers, even a small reduction in thermal load per device can add up. We hope to simplify the thermal requirements of these electronic devices."